Classification folder functions as the perfect file organizer, complete with tabs on the cover and dividers for easy titling. 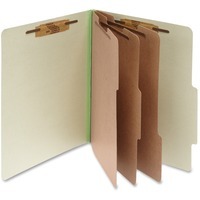 Durable, classification folders are ideal for keeping important documents in place. Each folder is made of 25 point recycled pressboard with expandable, color matched Tyvek gussets. Three partitions help create eight filing surfaces each with a 1 size fastener to maximize your filing opportunities. Each folder expands 4 to hold a thick stack of your important documents.